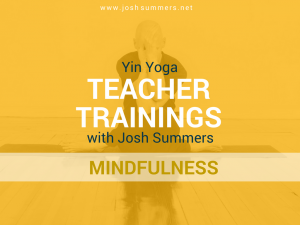 Yin Yoga Teacher Training: Mindfulness Module (50hr) with Josh Summers, E-RYT 500, YACEP, Lic. Ac. The 50hr Yin Yoga Teacher Training: Mindfulness Meditation Module is a comprehensive training in the theory and practice of Mindfulness Meditation and its application to the practice and teaching of Yin Yoga. This module is open to serious students and teachers of Yin Yoga who are interested in integrating meditation into their practice and teaching of Yin Yoga. Practice and understand the theory of the core aspects of Mindfulness Training: Steadiness, presence, and wisdom. 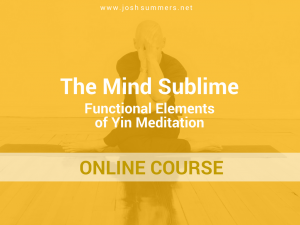 Explore “Yin” aspects and approaches to meditation, developing “Yin” qualities of mind and heart: Receptivity, gentleness, compassion, reflection, stillness, and silence. This Module will be structured around the Buddha’s core teaching on Mindfulness – The Satipatthana Sutta – The Sutta on the Four Foundations of Mindfulness. This text provides a treasure trove of material to share with students in a Yin classroom. For each category of contemplation (i.e. body, mind-states, etc), a variety of “yin” and “yang” forms of meditative tools will be considered and explored. Working with the Hindrances (Aversion, Desire, Restlessness, Sleepiness, and Doubt): Strategies and antidotes. Develop your ability to hold space, effectively use your voice and explore teaching cues that support the experiential learning and the unfolding insight of your students. Address approaches to teaching meditation in a secular, non-religious manner. How to instruct and guide meditative themes in your teaching. Students will receive a certificate of training which is eligible for Continuing Education Credit (50hrs) with the Yoga Alliance. This Mindfulness Meditation Module is a core module of the Summers School of Yin Yoga 200-hour and 300-hour certification program. Register for the live teacher training module by clicking the button below. Upon registration, you’ll get free 90-day access to the online course (a $125 value). You will need to complete the online course, including a short essay, before attending the live teacher training module. Estimated time to complete the online course: 5-7 hrs. The Summers School of Yin Yoga and Mindfulness Training was an incredible, life-changing experience. This training has brought me from believing I was a meditation failure to joyfully anticipating opportunities to teach Yin-based meditation. Josh’s humor, perspective, and outstanding preparation make him a tremendous teacher. I’d happily recommend doing training with Josh – he is insightful, intelligent, funny, and very knowledgeable. His Yin Yoga and Meditation module has changed how I approach my Yin Yoga practice — and has happily turned my previous meditation work on its head! The skills you learn in Josh’s courses are not just for your yoga practice and teachings, but for use in your everyday life as well. If you’re thinking about whether you should do this training or not…. don’t hesitate – just do it! I recently completed Josh’s Mindfulness Module – it was brilliant! 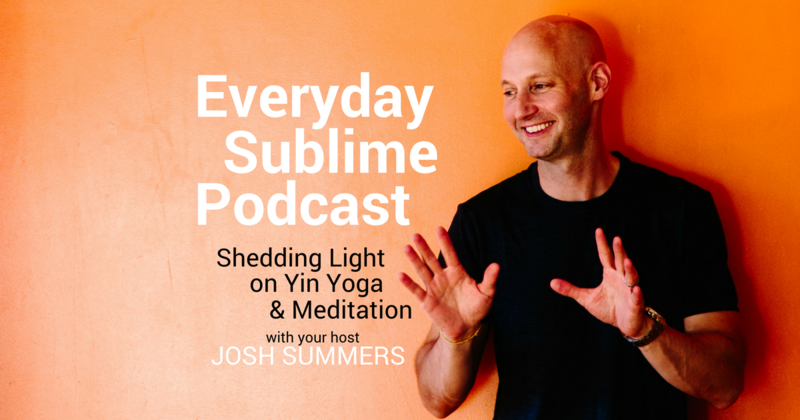 It was so interesting to look into the Buddha’s teachings and explore a new approach to meditation, but I think perhaps even more enlightening was Josh’s way of teaching. I’m really looking forward to completing the next module, and can not recommend Josh’s courses enough. Thank you, Josh, for sharing your time and energy with us in Freeport this past weekend. I enjoyed the workshop immensely, and the knowledge and understanding I gained through your teaching and insights are invaluable. Lots of raw material to chew on, issues to consider, concepts to embody and assimilate. Juicy, thought-provoking, and decidedly open-to-further-investigation questions and inquiries. Massive amount of deep reflecting and self-study. Practices to cultivate and thrive on. Expansive energy and animalistic hunger for more. Exactly what I needed. Great class. It completely upended my thoughts on what “good” meditation was (or wasn’t). Most importantly, Josh and Terry didn’t try to change the way that I meditate… but they gave me the tools to better understand HOW I meditate… and what I might want to consider in making my meditation practice more effective, more compassionate, and more resonant.